Prove you are worthy of the title Thane by assisting the people of Falkreath Hold. This is a radiant quest which you can receive from either Siddgeir or Dengeir of Stuhn, whichever is Jarl of Falkreath. The Jarl lives at the Jarl's Longhouse in Falkreath. Befriend the Jarl of Falkreath. Assist people of the hold three times. This is an umbrella quest for several other quests that must be completed if you wish to become Thane of Falkreath. 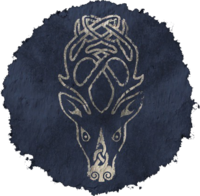 In order to receive it, you first aid the current Jarl of Falkreath - Dengeir or Siddgeir depending on your game choices. The previous quest will either be to kill a Bandit Leader if Siddgeir is Jarl; the Stormcloaks can take over Falkreath either by Rescue from Fort Neugrad or Season Unending, and either way Dengeir will allow you to start this quest. The Jarl requires you to assist the citizens of Falkreath Hold three times in order to become Thane. This can be difficult as there are only a limited number of quests in the hold and the quest givers are non-essential, which could result in their death and irrevocable loss of potential quests. Note, however, that you can also befriend merchants if you have the Investor perk by investing in their stores. Starting Siddgeir's Bandit Leader quest can be tricky. If you have Hearthfire installed, then at level 9, a courier will deliver a letter from the Jarl of Falkreath. Reading it will trigger the Falkreath version of Build Your Own Home and, when this quest is running, talking to Siddgeir will allow you to start the Bandit Leader quest without any prerequisites. However, the normal prerequisite for the quest is Rare Gifts, a radiant quest which can be given by six different people. If you have received this quest from any of the other five, then you cannot receive it from Siddgeir, and you must complete the quest for the other person before you can get it from Siddgeir. It is advisable that, if possible, Siddgeir's version of the quest should be completed soon after leaving Helgen, as the mead he wants can be found near the exit to the keep. Complete favor quests for citizens from the region. Highlighted quests can be easily completed without any skill use. Note that if Dengeir is Jarl, he will not give out his personal quests. If you completed Some Light Theft for him before making him Jarl then it will still count towards assisting the citizens of Falkreath. Drop some armor pieces in front of citizens and let them have it when they request it. Invest 500 gold in a store, such as Gray Pine Goods. Bounty quests will get you some money but will not help you become thane. The reward, the Blade of Falkreath, is a random, leveled, enchanted sword. There is a 50% chance that it will be a sword (one-handed), and a 50% chance it will be a greatsword (two-handed). You will also receive a pittance of gold and the title of Thane for Falkreath Hold. With the Hearthfire add-on, you will also be rewarded a personal housecarl, Rayya. The quest may become nearly impossible to complete if Lod dies for any reason or if you finish the Rescue from Fort Neugrad quest of the Stormcloaks before you enter Falkreath because the game does not accept radiant quests as favors. Assistance to citizens done prior to accepting this quest counts towards the total. Siddgeir may become stuck in a "Foe" relationship with you if you've killed his housecarl for the Dark Brotherhood (even if you did it secretly). If so, he'll never grant you Thaneship. This issue has been addressed by version 2.0.4 of the Unofficial Skyrim Patch; The relationship will only be harmed if you are caught killing the housecarl. If Siddgeir is no longer Jarl, the new Jarl will grant you Thaneship. The following empty quest stages were omitted from the table: 0, 10, 25, 200. On the PC, it is possible to use the console to advance through the quest by entering setstage Favor258 stage, where stage is the number of the stage you wish to complete. It is not possible to un-complete (i.e. go back) quest stages, but it is possible to clear all stages of the quest using resetquest Favor258.